First, players will set up the galaxy by taking turns placing their three planets. Be careful not to block your home base (the corner of the board). Each player also gets to choose one power up from two cards, which they may keep secret. To start the turn, a player will flick their spaceship, attempting to touch a planet with an available crystal. If the player gets their spaceship to that planet, they take a crystal cube of that planet’s color and place it in their ship’s cargo. As long as their flick was successful, the player may flick again. Instead of flicking, a player may also choose to return to their base. In addition to physically moving their ship back to the base, this action also moves the crystals they have collected from their cargo to their base. If a player flicks their spaceship out of the galaxy play area (the four corners represented by the four player bases), the player loses any crystals in their ship’s cargo and must return to their home base. However, if a player has all four colored crystals when returning to home base, they will be able to launch a bomb on their next turn. The player takes the bomb token and, standing behind their base, tosses the bomb token onto the universe play area. If the bomb covers all or part of a planet, that planet is destroyed. The attacking player collects that planet as points (different planets are worth different points). The player whose planet was destroyed collects two power up cards and selects one to keep. When seven planets are destroyed, or one player’s planets are all destroyed, the game ends. Players count up their points for any planets of their own left in the universe, as well as any planets they have destroyed. The player with the highest number of points wins! At first glance, this game looks a little bit like Cosmic Encounter, with the look and feel of the planets hanging out in space. However, this game is nothing like Cosmic Encounter. The act of flicking your spaceship around space is not only fun, but also unique. Flick ‘em Up has a similar flicking mechanic, but that mechanic is more about maneuvering around obstacles. The dexterity aspect of Cosmic Kaboom is fairly easy and straightforward (provided your game play area has a good base for flicking). A player can get many crystals in one turn (perhaps even all four!). However, if they move out of the galaxy, they will not only end the turn, but also lose the cargo they are holding. So there is some strategic element in choosing when to go back to your base to keep the cargo you’ve already gotten (relatively) safe. During our games, people losing their spaceship and cargo did happen a few times. Another interesting twist to the game is the power up cards. Some are one use (such as getting a re-throw of the bomb token) and some are permanents that stay in play (such as being able to steal a crystal from another player’s base if you flick your spaceship onto their base). They make each game different even when playing with the same players. Also, Cosmic Kaboom has not only one dexterity element, but two different ones. Someone who is skilled at one aspect may not do well at the other, which also adds some balance to the game. Also, as a dexterity game, you will most likely get better at flicking over time. The game pieces look great and are in keeping with the science fiction space theme. I like that they choose actual cube pieces rather than cardboard for the crystals you collect. They fit nicely in the spaceship cargo and the home base. The game is fairly quick to set up and learn. Gamers who enjoy a little kaboom and action will enjoy flinging their spaceship around and blowing up planets. There’s enough time in the game to get good at flicking and not fall too far behind if you mess up once or twice. Players who like dexterity games like Flick ‘em Up, even traditional pool or shuffleboard, and/or space themed games will enjoy this game. Overall, I would recommend this game as a good alternative to a card or board game. 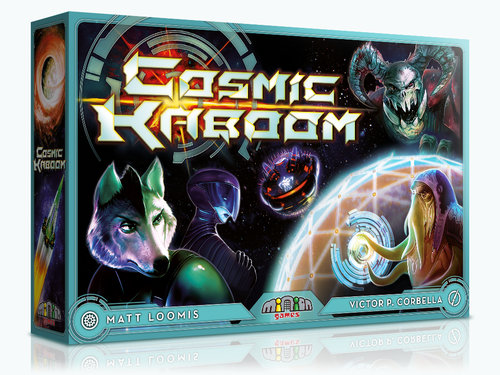 If you are looking for something a little more active, that involves getting up and moving around the table to get the best shot, you should definitely try Cosmic Kaboom. Calli Welsch is a writer, editor and content marketing strategist. In addition to helping kids learn math through games at MIND Research Institute, she enjoys reviewing games at Unfiltered Gamer, editing game rules, practicing yoga and working on challenging puzzles.